The goal of the Sensing Hazards with Operational Unmanned Technology (SHOUT) mission is to evaluate the ability of observations from unmanned aircraft systems (UAS) to improve the forecasts of high-impact weather events and mitigate any degradation in the forecasts in the event of a gap in satellite observations. The project has collected observations during three dedicated campaigns with the NASA Global Hawk to support model-based data impact studies. The targets have included tropical storms (2015 and 2016) and major Pacific winter storms (2016). This page serves as a preliminary archive of the data collected during these flights while the final archive is being constructed. SHOUT also helped to support hurricane observations in 2014 in partnership with the NASA Hurricane and Severe Storm Sentinel (HS3) mission - those data are archived in the HS3 data collection. For more information, please visit the SHOUT project homepage . Three flights conducted in August-September 2015 investigating two tropical storms. 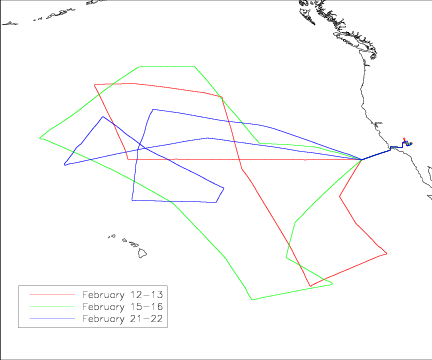 Three flights conducted February 2016 investigating three Pacific winter storms. Nine flights conducted August-October 2016 investigating three hurricanes and one tropical storm.